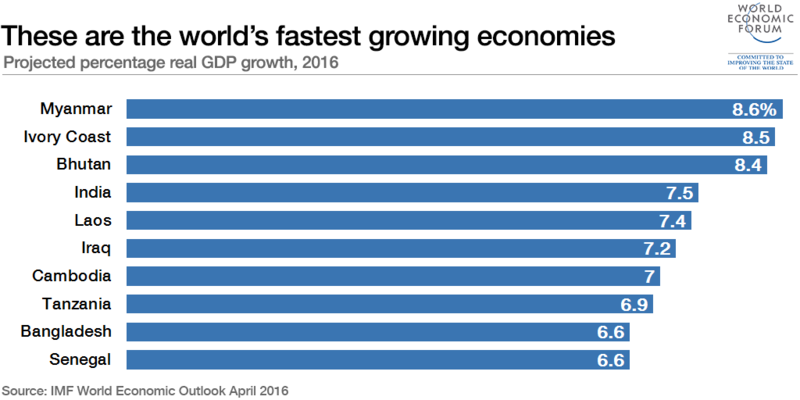 Myanmar is the world’s fastest-growing economy, according to the IMF’s latest World Economic Outlook. The country’s GDP is projected to grow by 8.6% this year. Political and economic reforms, which have made headlines around the world, have supported this economic growth. Increased consumer and investor confidence, and rising exports, have boosted the economy, argues the World Bank. However, inequality and poverty remain a significant problem across the country. 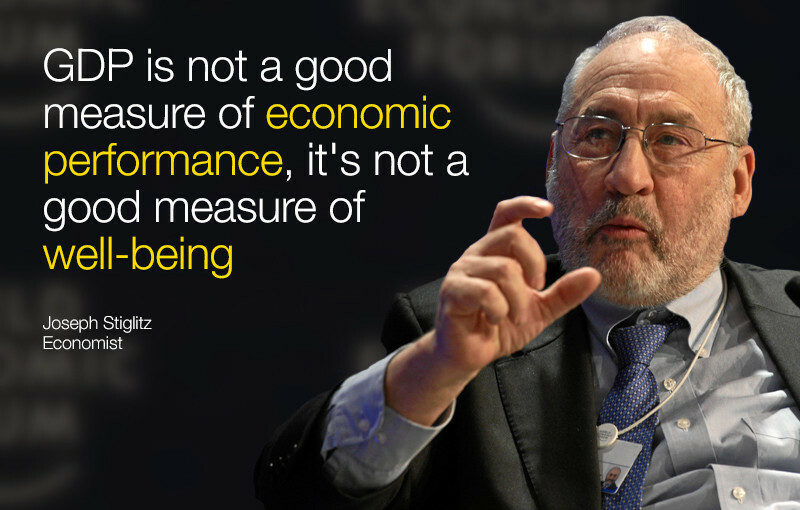 This is true for many of the world’s fast-expanding economies, which are typically not the biggest or most developed. 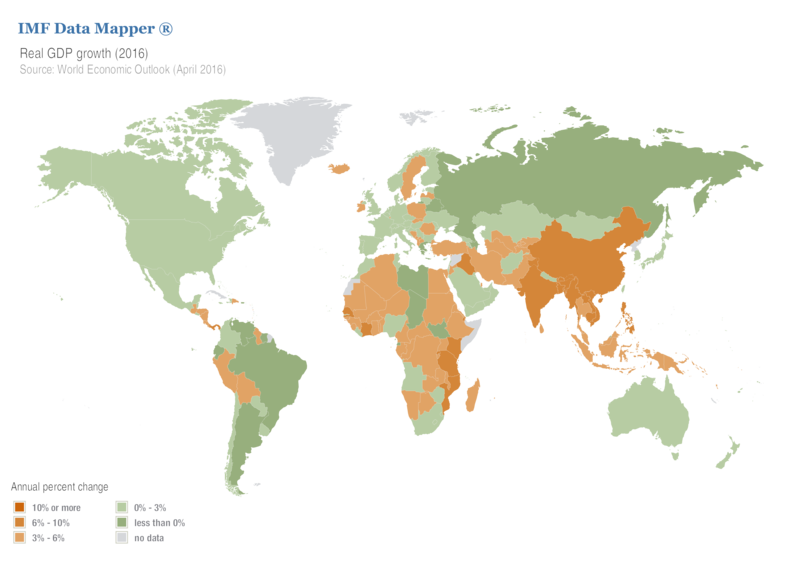 This map from the IMF explores the situation around the world. It highlights the rapid growth being experienced across much of Asia and Africa. The Ivory Coast follows Myanmar in second place, with projected GDP growth of 8.5% this year. Third on the list is Bhutan, with 8.4%. Other countries predicted to return high growth figures include India, Laos and Tanzania. An interactive version of the map, showing growth from 1980 to 2021 can be found online. What about advanced economies and emerging markets? 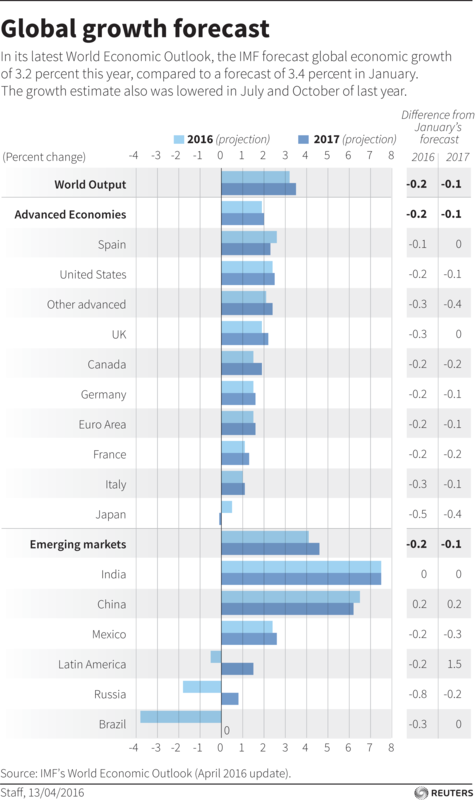 Growth of around 2% is projected across advanced economies this year and next. Japan is an exception to this, with April’s projection predicting growth of less than 1% this year and negative growth next year. Across the board, predictions have been lowered since January 2016. Emerging markets are still expected to see strong growth, driven by India with over 7% and China with more than 6%. This despite China’s much publicized slowdown and economic transition. Indeed, the latest projections for China are an increase on January’s IMF figures. The outlook this year is for negative growth in Russia and Brazil, but this situation is expected to improve in 2017. At the World Economic Forum’s Annual Meeting this year, three leading economists argued that we should be looking beyond GDP as a measure of progress. Christine Lagarde, Joseph Stiglitz and Professor Erik Brynjolfsson all suggested that a changing world requires a change in how we assess progress. Although GDP forecasts offer a useful insight into economic performance around the world, there are increasing calls for other factors to be included, such as well-being and quality of life. A. Michael Spence and Sir Charles Bean have also argued for new measures.